ControllerMate is a controller programming tool that allows custom functionality to be added to standard HID devices (joysticks, trackballs, gamepads, keyboards, and more). Using a graphical interface and drag-and-drop editing, users can program controller buttons to perform complex keyboard and mouse sequences. Programming is accomplished using "building blocks". Each type of building block performs a different type of function. ControllerMate building blocks are triggered by controls on devices or MIDI messages. Each type of building block performs a small task. Building blocks can be combined to perform complex functions. ControllerMate now includes more than 70 types of building blocks! Some building blocks respond directly to controls on devices. Others perform logic, math, or timing. Yet other blocks trigger activity on ControllerMate's virtual mouse or keyboard, perform AppleScripts, open files, or launch applications. The possibilities are virtually limitless. Driver configurations can be used to change the default behavior of a keyboard or mouse that uses ControllerMate's driver. All buttons on a keyboard have some default function or another. Most are useful, some are not. A driver configuration allows one button on a keyboard act like another, or can turn a button off completely. Buttons that have been turned off can still be used to trigger building blocks. A driver configuration for a mouse can include a custom acceleration curve. This curve can be one of the standard curves, a standard curve with an adjusted speed or sensitivity, or an entirely custom curve created point by point. Multiple configurations can be created for the same keyboard or mouse - use building blocks to control when a configuration is active. MIDI messages can now trigger building blocks just as easily as buttons on a joystick, mouse, or keypad. MIDI notes, controller values, or patch changes can be used. ControllerMate can also create and send MIDI messages through a virtual MIDI source. This allows generic input devices to be used to control applications that listen to ControllerMate's virtual MIDI source. ControllerMate can create virtual mouse, tablet, and joystick devices that are controlled by ControllerMate programming. The virtual devices are seen by most other applications just as though they were actual devices. 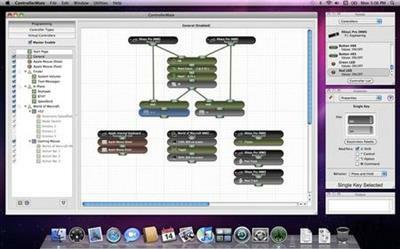 Every move that a virtual device makes is controlled using ControllerMate's building blocks and driver configurations. ControllerMate includes a helper application that runs in the background, monitors the attached controllers, and performs the current programming when the ControllerMate application is not running. After you have finished setting up your building blocks and driver configurations, quit the ControllerMate application and the background application takes over. No graphics, no user interface, no unnecessary processor cycles.